Online video continues to drive real results for online retailers. The benefits are real for large brands, but also for smaller retailers. A great example is Brightcove customer, InteriorMark, an online retailer of furniture, who has seen a quantifiable impact to their business with the addition of video to their online stores. I had the opportunity to speak to Bruce Tucker, founder of InteriorMark and the person responsible for driving InteriorMark's use of ecommerce video. Bruce explained the main driver for the company pursuing video ecommerce, their strategy in making it a reality across their online stores and results they've seen. InteriorMark operates several online retail stores, including Theater Seat Store, Sofas and Sectionals, and Entertainment Center Spot. All of InteriorMark's stores are online and have no brick and mortar locations. Since furniture is one of those products consumers like to "touch and feel" before purchasing, InteriorMark needed a way to bring the products to life to help customers better understand what they were buying. Video offered the perfect solution: it brings the product to life by demonstrating to the buyer particular features and how they are used. Procure videos from suppliers - Suppliers provided videos which InteriorMark could place on product pages. 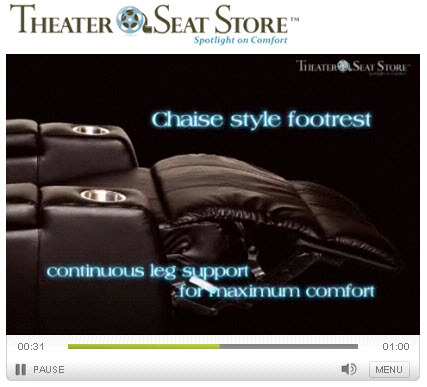 An example of this is a video they procured from their supplier, Berkline, for one of their home theater furniture offerings. By procuring this video from their supplier, InteriorMark was able to quickly and inexpensively get video on their site. Use an automated production method - A quick and inexpensive method for getting product videos on their site was the use of automated video production methods with vendors who are also Brightcove partners, such as Animoto. Examples of this are a video for one of their sofa products, a video for a TV lift piece of furniture, and another for home theater seating. Use traditional self production- For selected products, InteriorMark produces their own video to showcase products. An example is this video for a recliner product. Traditional production costs more, but allows for greater control by InteriorMark over the storytelling in the video. InteriorMark uses video to tell the overall "story" of the product, but also to explain specific features. The videos are all placed directly on product pages, where they have maximum impact on conversion. InteriorMark also hosts the all the video on Brightcove, which they selected as their online video platform of choice to meet their video ecommerce needs. They use Brightcove in conjunction with their ecommerce platform, and other ecommerce systems to manage an end-to-end video ecommerce solution. a 40% increase in Web order sales since the introduction of product videos. This has had the added benefit of reducing the number of orders placed by phone, helping to reduce the number of people required to man the telephones, and thus decreasing costs. These results make InteriorMark a firm believer in using video for ecommerce, as Bruce Tucker attests: "Video communicates the value of the product better than any other means. All online retailers should be thinking about how they can make video a core part of their ecommerce strategy. Results with video are for real." Download the V-Commerce: The Rise of Online Video whitepaper to learn more about how you can leverage the power of video ecommerce.